I took Friday off and drove down to Sioux City for a Young Dubliners show. The show rocked. After staying the night at a motel in Vermillion, Indy (my dog) and I headed up to Sioux Falls for a Scheels fix and then to join up with the SDCA crew for a cruise on the Big Sioux River. 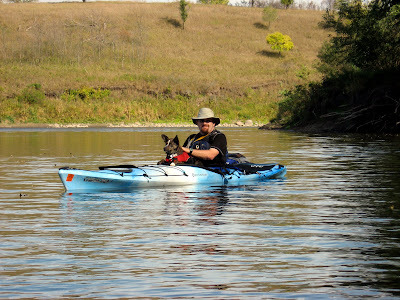 We met at the BSR access near Lake Alvin and paddled to the access upstream of the dam at Klondike, IA. As a note, some time in the future, the dam will be made passable with riprap, etc. Should be a lot of fun once that happens. The trip was quite enjoyable. All the participants spread out a fair bit. Indy was getting a little bored during the first half of the trip, so I let him swim/walk along the boat a couple of times. Kind of a trolling motor! He really seemed to enjoy it; plus it took a lot of energy out of him. He behaved very well for the remainder of the trip; laid nicely on the deck/skirt. Nothing else too exciting to post; we did not see much for wildlife. plenty of cattle in on spot and a few small birds. I spent a bit of time chatting with Jay Heath along the way and he should have some good pictures of Indy and me. My gps read about 8.1 miles. Some pictures below; they did not turn out the best as it is a bit difficult to deal with a dog and a camera while paddling. Should be better once I start taking Indy out in my tandem.